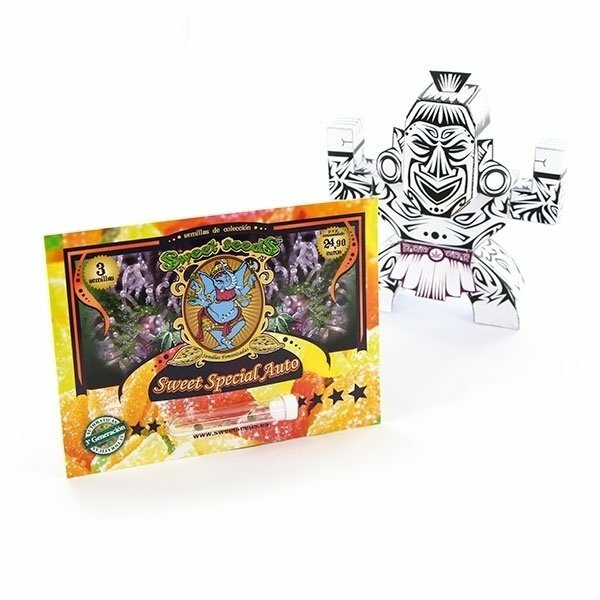 Sweet Special Auto by Sweet Seeds will caress your palate like a piece of candy. This feminized and autoflowering strain is famous for its amazing taste, which is a result of crossing Grapefruit strain, a very good Hog, and the Cream Caramel Auto. One may take a chance to say that these will be the most delicious nugs you have ever smelled. This candy type aroma hasn’t been available for autoflowering cannabis plants so far. The weed has a harmonious effect of both mental high and body relaxation. You will love this treat after a long hard day. Since Sweet Special auto is so easy to cultivate, any grower will be more than happy to take care of it. This lady is not demanding when it comes to growing conditions. The plant grows rather short (from 60 to 100 cm) and demonstrates beautiful large buds densely covered in trichomes. Be prepared for harvest after 8 weeks from the germination and expect from 400 to 550 g/m² of great aromatic marijuana. You will surely not regret any minute devoted to her.